So make sure to bookmark this spot and come back between 9:00 PM – 10:00 PM ET for our NCIS Los Angeles recap. While you wait for the recap make sure to check out all our NCIS: Los Angeles recaps, spoilers, news & more, right here! 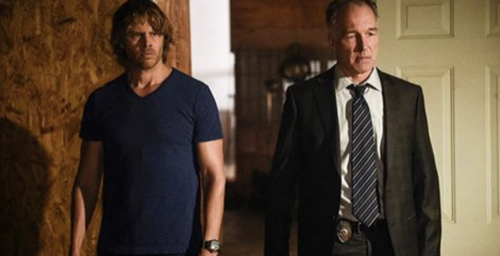 Tonight’s NCIS Los Angeles Recap begins now – Refresh Page often to get the most current updates! LAPD Detective Ellen Whiting needed Deeks’s help. The detective had been working with IA to investigate whether some on the force were working on the side as private contractors when their investigation led them to Lieutenant Roger Bates. But Bates was more than just a person of interest. He was being looked at as the man running the illegal racket and there was even footage of him shooting another cop. So Whiting wanted Deeks’s help because she knew Bates would call him and she wanted Deeks to turn the other man in however Deeks didn’t want the job. Deeks firmly believed Bates was one of the good ones. He worked with him and knew him better than most. However, Whiting didn’t care about what Deeks believed. She had actual footage on her side and therefore she hadn’t given Deeks much choice in helping her. Whiting threatened to tell everyone about what happened to Deeks’s former partner unless Deeks did what she asked. So Deeks had said that he would do it and later he had met with Bates. Bates had been on the run and had needed some place to hide though he hadn’t been sure about who’s side Deeks was on. A patrol car had eventually pulled up behind them and so Bates thought Deeks had turned him in. Though he pulled a gun on Deeks to get him to keep driving and so all that did was warn the police that the two were together. So they loss the cop car and they also had to ditch Deek’s car to lay low, but their actions did get around to NCIS. NCIS had seen the footage of Deeks’s car hitting a patrol vehicle and they had even found it was becaue of Bates. So they had wanted to know how Whiting was involved because Deeks had told Kensi he was going to meet the detective. But the detective had also been concerned. Whiting said she didn’t like Deeks yet that doesn’t mean she wants something to him and she thought something might because of the investigation. She told NCIS about the racket inside LAPD and how dirty cops were taking outside job to make things disappear yet she said she put Deeks on it because she had a prior arrangement with him and so the guys told her that she now had an arrangement with them as well. So Sam and Callen went to the boathouse. The boathouse was off the grid and not many knew about it. Therefore, it was the perfect place for Deeks to take Bates and it turns out they had also brought along a third person. The other guy was Simon and he was the supposed protected witness that Bates kidnapped though hadn’t been a witness. He too worked for the big boss and they were moving around a lot of money for the LAPD that had at least affirmed Bates’s innocence to Deeks because Deeks said no one with cash would wear Bates’s suit. Yet, that amount of cash also meant it was part of something bigger than dirty cops. Deeks and Bates had needed Sam and Callen to work one end of the investigation as they worked the other. The detectives wanted to look into who else could be dirty. However, Sam and Callen had wanted to follow the money because they were concerned a foreign power might have compromised the LAPD to deliberately security. So both of their investigation eventually met up when the money guy went straight to a safehouse for dirty cops because he thought they were going to help him make the prearranged drop. The money guy was supposed to facilitate in the sale of a biological weapon. A weapon that Simon had created and that had been taken off of him. But Ryan Wallace was willing to hand over this weapon because it was very much a weapon to someone named Stephen Lee and the drop was later that day at a college campus. So NCIS got Wallace to play along and continue with the drop-off exchange for a lighter sentence though no surprise he tried to make a run off for it after dropping off the weapon to someone that wasn’t Stephen Lee. Lee had gotten another guy to take the suitcase and then the container had been handed to a blonde. Though by time they stopped running rings around each other, the guys found Lee and snatched back the virus before it could be used. So NCIS and LAPD stopped a potential catastrophe and eventually they even found out who had put everything in motion. The dirty cop that had used his fellow officers to assist in a treasonous act had been someone at a desk. And so Whiting moved to arrest him yet Bates who finally cleared his name had gone home. Bates had lost two wives to the job and he said he had wanted to go home before his third wife decided to leave him as well. Yet, both Bates and Whiting thought Deeks was a good detective and so the door was always open for him to come back.